A proud moment for all space nerds. Confession time: I am a space geek. Always have been. I remember as a kid reading about the first lunar landing in 1969 and being angry that it had happened before I was born. This was during a quiet period for the U.S. space program, between Apollo and the space shuttle. Without missions to follow, I read. I learned the history of NASA. One year for Halloween, I had my mother make me a space suit. After Halloween, I slept in it. Every night. For years. When it wore out I insisted she make me a new one. To make it more realistic, I wrote a letter to NASA asking for mission patches. They sent me a packet of goodies, including a bunch of patches that I had my mother sew on the suit. I watched the first shuttle mission in 1981 with fascination (and while wearing my space suit). When The Right Stuff came out, I had my parents take me. It remains my favorite all-time film. One hundred percent. Bleepin’-A, Bubba. Let’s light this candle. So of course I was watching at 1:30 a.m. Monday when we landed a rover the size of an SUV on Mars. We can have a healthy debate as to whether this was $2.3 billion well spent, but there is no denying that this was incredibly cool stuff. This is not your father’s NASA. 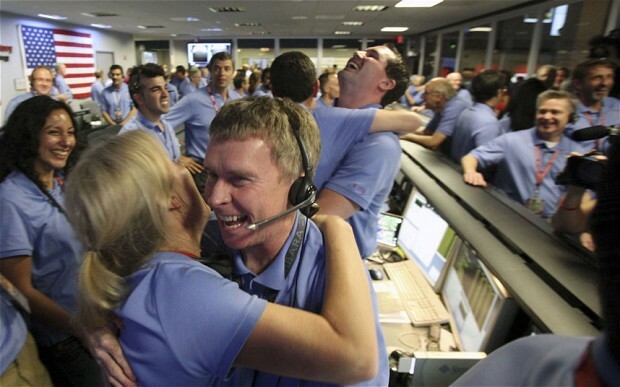 Mission control is no longer a room in Houston filled with identical, buzz-cut, white-shirt-and-tie wearing white males. Instead, mission control is at the Jet Propulsion Laboratory in Pasadena, Calif., and is full of nerdy-looking scientists, engineers, and computer programmers. As the cameras caught this group wildly celebrating its success, the difference struck me. There were men and women. Different skin colors. Different ethnicities. Long hair. Long beards. Mohawks. Earrings. Maybe a few tattoos. I thought about this group. I speculated if any of these supreme coders, engineers and scientists (and probably a few hackers in a different life) were on the autism spectrum. Certainly some were outcasts. Probably more than a few were picked on for being “different” while growing up. Most likely they all had a passion, a single-minded focus bordering on obsession. They all had managed to find their niche in life. Look what they achieved! I checked Twitter. My timeline is probably two-thirds people who write about or are involved in sports for a living. Most of them were tweeting about how blown away they were by what this group of scientist/geeks had just pulled off. That’s a reversal, isn’t it? Jocks celebrating the achievements of a bunch of nerds. My thoughts turned to Ryan, a possessor of many of the traits I speculated about in that control room. What will the future hold for him? Will he find his niche the way this group so clearly had? I am always searching for ways to connect Ryan’s interests and strengths to real-world occupations. Though he plays hockey, his passion is more for following the sport, in particular its statistical minutia. He loves the standings, for reasons I have described before. Lately he has paid more attention to the statistics compiled in each game: shots on goal, save percentages, and the like. He asked me how they keep track of shots on goal at an NHL game. I told him there is a crew of statisticians that work for the NHL at every game. They sit in the press box with laptops, recording everything that happens. Such a typical expression of childhood. But it was the first time I had heard him say anything beyond being an NHL player. More importantly, the first potentially realistic job preference he had expressed. I told him that maybe he could grow up to be a member of one of those crews. I thought of how I might call in a favor or two to get him admitted to the scoring booth at a preseason game. I thought of him finding a job where his obsessive love of the sport — to the point that I know some of his peers see as weird — would fit right in. Where it would be a strength. Where he would find his niche. Sunday, I had an adult league hockey game at an unusually decent hour. I asked the kids if they wanted to come watch me play. They did. Veronica shuddered. We’ve done this a few times before: Riley barely pays attention, Ryan runs all over the rink screaming loudly. But Veronica is a trooper, so she agreed. I couldn’t help but smile. It was perhaps the first time I envisioned Ryan in an actual career that he enjoyed. Maybe it’s a pipe dream. Maybe Ryan won’t care about hockey as an adult. (Although I now find that unlikely.) And there’s more to landing a job in a field you enjoy than just loving it. But it’s a goal. Something to aim for and encourage. Not so long ago, landing an SUV on Mars was a pipe dream, too. Speaking as a fellow space geek (and I’m old enough to have watched the day Glenn orbited the Earth as well as the moon landing), this is a big deal. Then again, so is Ryan’s progress. Great job bringing them both together with your usual excellent perspective. I’m thrilled that we are continuing to explore outer space. What they are doing on Mars is unbelievable. I do the same with my boy. Nothing as of yet but I’m keeping my eyes open! This is a great post. I really enjoy your writing. And knowing you’re a closet science geek greatly increased your likability. Thank you. Science, history, technology. I’m a geek in a many ways. I’m just happy that being a geek is a lot more acceptable these days. acceptable for us adults, yes. i’m still seeing the same old jock-cheerleader dynamic in our local elementary school. (small town, southern Louisiana) but I’m hopeful that change is imminent. My neuro-typical 8 year old is even more of a nerd than I, so I’m quick to reassure her that adulthood is awesome for nerds. On Saturday night, she and I will be finding a remote field far away from the lights of town to enjoy whatever view of the Perseid meteor shower we can grasp. Loved this one…we are space geeks, too. I am trying to spark a space interest in my kids. I think I stand a better shot with Riley. Took her to the Wright Bros. memorial and made sure she understood we went from Kitty Hawk to the Moon in 66 years. Still mankind’s most amazing technological achievement if you ask me. The media company I work for did a brief bio-documentary on an astronaut that grew up in a small town in Nebraska. I thought you may be interested. Thanks for posting. Looks like an interesting project. I like that long term goal. . . no pun intended. Honestly it should be everyone’s desire to find a job doing the thing he likes best. . . maybe ryan will score! I consider myself incredibly fortunate to have one of those careers. It is a gift. I hope for the same for both my children. A really wonderful post! Finding that passionate interest and then creating that vision of the future – nothing more powerful. Go mark it on your nerdy calendar for 10 years time – how close is Ryan to achieving his goal? Had not heard of “The Dish” but I’d love to see it. Just checked Netflix but they don’t have it on-demand. If you’ve ever seen “The Right Stuff” – which covers the Mercury program that came before Apollo – there are a couple of scenes in Australia where they used a giant satellite dish (I assume that’s the reference in the title of the film you mention) to help track John Glenn on his first orbital flight. Next time you guys come visit we will definately go to the Air & Space Musem just down the road. The Space Shuttle is there right now. A friend of mine was just there for a private even and talked about having a drink standing under the Shuttle. On another note Ted’s statistics ability is a big part of what he does for a living. I believe that Ryan will find a wonderful career down the road. But that is a very exciting step for him. I warms my heart!